I made a temperature sensor using a Dallas DS18B20 and the MySensors.org sketches (https://www.mysensors.org/build/temp). The sensor broadcasts to the MySensors MQTT gateway which is an Arduino Uno with an Ethernet shield. 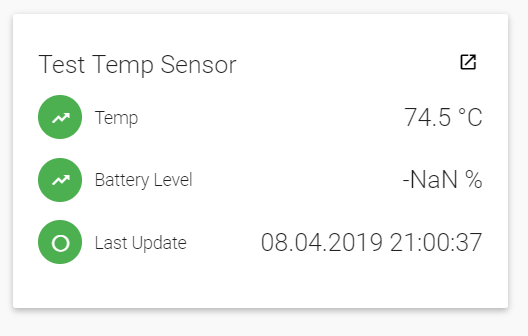 After setting up the thing and items in PaperUI the temperature reading value in OH2 appears to be in Fahrenheit but the text label is still Celsius. I can’t find anywhere in OH2 to change the text label to be °F. I also would like to reformat the date/time code for Last Updated but can’t figure out where this is controlled. Is there a global setting for display formatting somewhere that I missed? What type of Item have you applied to the Item linked to the channel? Number or Number:Temperature? You appear to have shown a screen shot of the Control tab in PaperUI. That tab has almost no ability to customize how anything appears. To control the format of the date time and potentially the units on the temp you need to create a Sitemap or HABPanel.